Mel and Alex knew that this three-bedroom house in south-east London had bags of potential when they bought it in 2012. They put in an offer in the September, spending their first New Year here in 2013. Find out what they did next, then explore more real home transformations and find our more about extending a house in our guide. Discover more about building a side return extension in our guide. 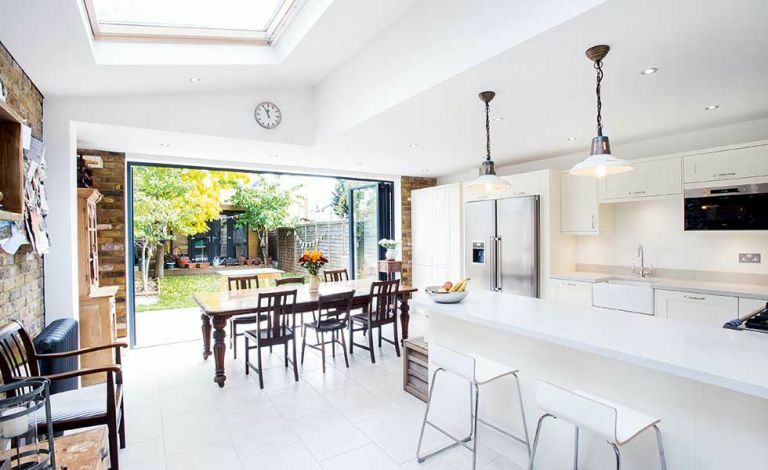 While the couple couldn’t afford to start work on the house immediately, they realised the generous side return would present them with a promising opportunity for an extension, transforming the narrow kitchen into a space perfect for hosting family and friends. Alex sought help from an architect who worked in the studio below his office in east London. ‘I invited him to come and look at the flat,’ says Alex. ‘He was the one that suggested we include a utility room with WC and shower room.’ The plans also included a dining area next to the kitchen and a pitched roof; that way they could incorporate the Velux windows, which, together with the bi-fold doors, would bring in copious amounts of light.